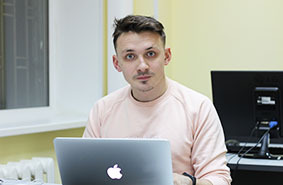 The young researcher is engaged in prediction of novel materials’ structures and description of phase transitions under supervision of Prof. Artem Oganov. Artem Samtsevich participated in scientific schools held by SCTMS scientists. He is visiting SCTMS for the second time to study ToposPro software package and perform joint research work. Currently Artem is working on prediction of phase transitions in novel superhard phases of tungsten borides.